I was very fortunate to be at Wembley Stadium in 1985 to witness what has been described as the greatest single performance by a band, being part of the 75,000 crowds there for Live Aid but leaving with Queen and particularly Freddie Mercury in the forefront of our minds for years to come. Bohemian Rhapsody, the story of Queen up to that performance, sadly never reaches the heady heights of that incredible 20 minutes and feels like it is underselling that superstar. London 1970 and a young baggage handler persuades a small jobbing band, Smile, to join as the lead singer. 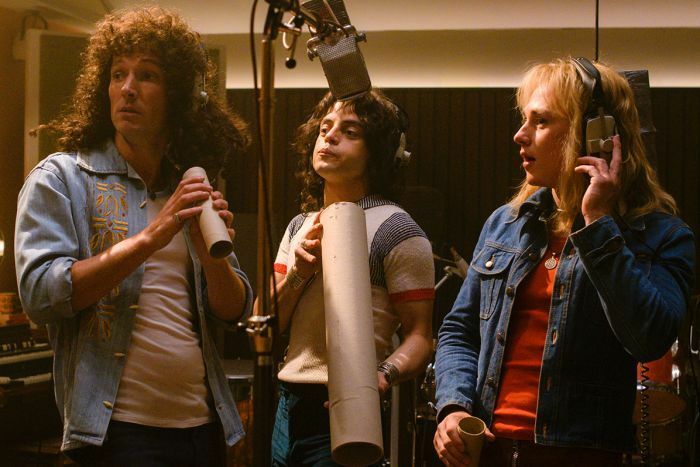 With Brian May and Roger Taylor already on board and John Deacon being brought in as bass, Freddie Mercury, an Indian living in London, is born and we see the rise of a band refusing to follow conventions, adding sounds and crossing genres, leading to the creation of the classic song, Bohemian Rhapsody. Yet with fame comes the pressures and those who want to take advantage of a star struggling with his own sexuality and his own creative unpredictability. It has been greatly reported that Bohemian Rhapsody has not had a smooth ride. With original star Sasha Baron Cohen leaving the project due to creative differences and the director firstly being accused of sexual misconducts and then being fired, again through creative differences only to be replaced, even though his name is still attached to the production as director, it is amazing that the film even exists. Yet here it is with all the flamboyance of its lead singer but feeling entirely empty. The film plays out like a by-the-book biopic with all the boxes and cliches ticked. There is nothing here that either we haven’t seen before in other rock movies or know about the band itself. One of the problems is that having Brian May and Roger Taylor on board in the production team, there is never going to be anything dangerous or shocking. Like Straight Outta Compton, where NWA are shown as very nice, law-abiding rappers whose only problems are contractual, there feels like an untruth around Freddie and his bandmates. The in-fighting comes across as cosy and you feel like the band could have been so much more vicious. Mercury’s spiralling out of control lifestyle, led on by former yes-man Paul Prenter, also feels false and cliched, while never going far enough, at the same time following a stereotype of a homosexual man with the leathers and moustache. There are also problems with timelines and a joke involving Wayne’s World that is incredibly out of place. Yet when the performances are shown, the film suddenly grows in statue. It’s a pity these are often cut short, apart from the complete reenactment of the Live Aid performance that graces the final section of the film. The performances are also very good with the actors playing the Queen members all doing very good jobs. Tom Hollander is sadly wasted as the group’s lawyer and Mike Myers is strangely miscast as the EMI executive who seems out of place even for the time. Yet it is Remi Malek’s interpretation of Mercury that really carries the film. He is magnificent as the charismatic frontman who is quiet behind the scenes and a monstrous explosion when on stage. Miming to the great man helps bring Freddie to life and if Malek had a better script to play with, this could have been the performance of the year. There are some funny one-liners but they are few and far between and the cast are expected to deliver some clunkers. Fans of Queen will love the music being played as loud as possible and seeing it on IMAX works extremely well especially during the Live Aid stuff. Sadly the rest of the film just goes along without offending or shocking. There is a 15 certificate film waiting to be found but maybe without May or Taylor attached and we can be allowed to see the real events of a band that defines the words supergroup. With A Star Is Born being a fictional account of the world of music, it felt much more real than this.